To honor his bride, Mary, he worked to craft and deliver a profound and very moving “surprise” as part of their wedding ceremony at Seattle’s Edgewater Hotel. James is a military guy. As a loving tribute to Mary, he invited six of his colleagues to create a “down the aisle” ceremony ritual with swords, commands and special words. Mary didn’t know a thing about this. After I pronounced James and Mary “husband and wife,” I turned to Mary and shared what James had up his sleeve. And gratefully, the eloquence and sweetness of this susprise worked beautifully for our bride. 1) Being appropriate – meaning insure that a proposed surprise will be publicly well-taken by a bride/groom. 2) Fun-loving. Often a surprise can be overwhelming. You can neutralize the “overwhelm” of a surprise by insuring it has fun-loving and or humorous elements to it. 3) Well-timed. A best surprise within a ceremony is carefully orchestrated between a bride or groom and the Officiant. 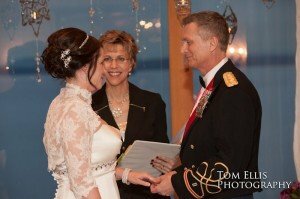 The Officiant most often has control of a surprise ‘set-up’ and this is key to insuring the overall integrity of a ceremony.